A girl has died after being swept away by a river on Dartmoor in Devon during a training expedition. The teenager's friends raised the alarm by mobile phone after losing sight of her at Walla Brook near Watern Tor. She was one of 20 youngsters from three groups rescued from the moor while training for the Ten Tors Expedition. 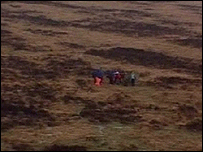 The death of the girl from Bideford was described by the Army, which organises the Ten Tors, as "very sad". Her school said it was shocked by the tragedy. Police said her family were being supported by officers and an investigation into the incident had begun. Weather conditions on the moor at the time were poor, with heavy rain over a 12-hour period causing swollen rivers. The girl was in a party of 10 teenagers from Bideford preparing for the annual expedition, which sees thousands of youngsters walk on courses of up to 55 miles (86km) across the moor. The alarm was raised by the girl's group at about 1405 GMT on Sunday. The police, Dartmoor rescue services and a Royal Navy helicopter were called out to search for her. She was located within about 20 minutes by a rescue helicopter and airlifted to Derriford Hospital in Plymouth, where she died overnight. The coroner's office has been informed of the death, police said. It is understood that the death of the girl, who was a student at Edgehill College in Bideford, is the first in connection with the event. The college said in a statement: "We are all shocked by the tragedy and are working to support all the pupils and staff in coming to terms with what happened. "The pupil was a delightful member of our school community. She loved to be involved in all the activities the school runs and shared her love of sport by helping to coach younger pupils. We will all miss her enormously." The mayor of West Devon, Ken Williams, also spoke about the incident, saying it was a "shocking tragedy". The event is organised by the Army's 43 (Wessex). An Army spokesman said that it was up to teams how they delivered training, although the Army had a duty of care during the event itself. Managers of teams were made aware of what members faced during the event, during compulsory weekend events in January. "Managers are well aware of what their own charges can expect," the Army spokesman said. The Army added there were no plans to cancel or change the 2007 event at present. Members of the two other groups who got into difficulty were also rescued by helicopter. All three teams were taken to Okehampton Battle Camp for checks, then driven by ambulance to hospital. One sustained leg injuries and others were suffering from hypothermia, police said. Everyone was accounted for and safely taken off the moor by Sunday afternoon. In a separate incident, the helicopter from Cornwall's RNAS Culdrose base, which rescued the teenagers, was involved in airlifting a man and a woman who later died after being swept into the sea at Mullion Cove in Cornwall on Sunday afternoon.